Jair Bolsonaro was sworn in as Brazil's president Tuesday, giving him control of Latin America's largest and most populous nation with promises to overhaul myriad aspects of daily life and put an end to business-as-usual governing. For the far-right former army captain, the New Year's Day inauguration was the culmination of a journey from a marginalized and even ridiculed congressmen to a leader whom many Brazilians hope can combat endemic corruption as well as violence that routinely gives the nation the dubious distinction of being world leader in total homicides. A fan of U.S. President Donald Trump, the 63-year-old longtime congressman rose to power on an anti-corruption and pro-gun agenda that has energized conservatives and hard-right supporters after four consecutive presidential election wins by the left-leaning Workers' Party. Bolsonaro was the latest of several far-right leaders around the globe who have come to power by riding waves of anger at the establishment and promising to ditch the status quo. Congratulations to President <a href="https://twitter.com/jairbolsonaro?ref_src=twsrc%5Etfw">@JairBolsonaro</a> who just made a great inauguration speech - the U.S.A. is with you! Tuesday's festivities in the capital of Brasilia began with a motorcade procession along the main road leading to Congress and other government buildings. 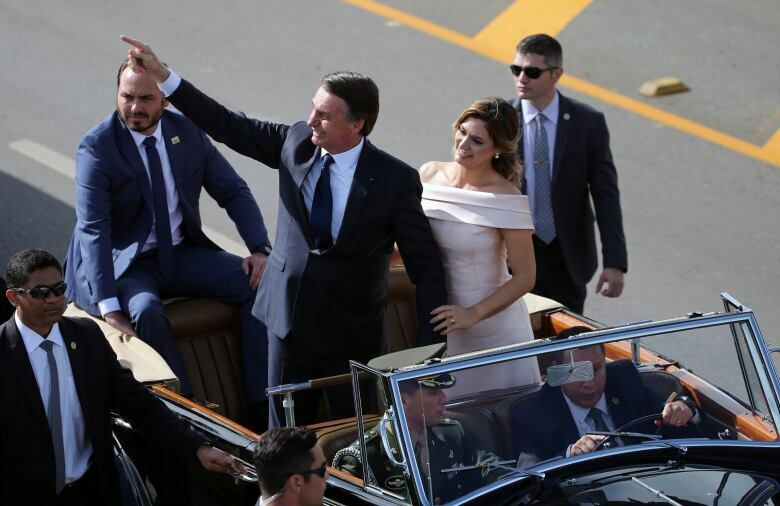 Bolsonaro and his wife, Michelle, stood up in an open-top Rolls-Royce and waved to thousands of onlookers. They were surrounded by dozens of guards on horses and plain-clothes bodyguards who ran beside the car. Once inside Congress, Bolsonaro and his vice president, retired Gen. Hamilton Mourao, took the oath of office. Bolsonaro then read a short speech that included many of the far-right positions he staked out during the campaign. He promised to combat the "ideology of gender" teaching in schools, "respect our Judeo-Christian tradition" and "prepare children for the job market, not political militancy." "I call on all congressmen to help me rescue Brazil from corruption, criminality and ideological submission," he said. A short time later, Bolsonaro spoke to thousands of supporters outside, promising to "free Brazil" from socialism and political correctness. As he spoke, supporters began to chant "Myth! Myth! Myth! "— a nickname some give to Bolsonaro because of his middle name, Messias, or Messiah in English, and a belief that he was chosen by God to lead Brazil. 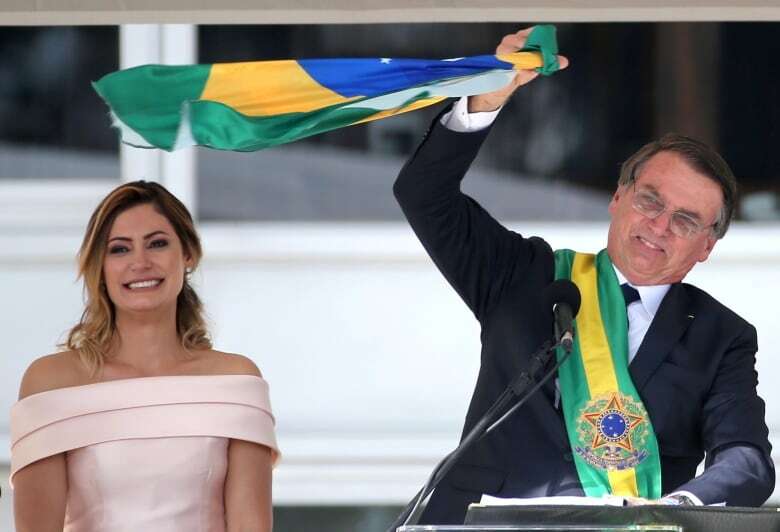 At one point, Bolsonaro stopped speaking, pulled out a Brazilian flag and wildly waved it, prompting roars from the crowd. Brasilia was under tight security, with 3,000 police patrolling the event. Military tanks, fighter jets and even anti-aircraft missiles also were deployed. Journalists were made to arrive at locations seven hours before festivities began, and many complained on Twitter of officials confiscating food they had brought for the wait. The increased security came at Bolsonaro's request. His intestine was pierced when a knife-wielding man stabbed him at a campaign rally in September, and he has to wear a colostomy bag. His sons, politicians themselves, had insisted their father could be targeted by radicals, but security officials have not spoken of threats. Bolsonaro did little moderating since being elected in October, with progressives and liberals decrying stances that they say are homophobic, sexist and racist. The new president, who spent nearly three decades in Congress, has also drawn international criticism for his plans to roll back regulations in the Amazon and his disinterest in social programs in a country that is one of the world's most unequal in terms of income. On the economic front, where Bolsonaro will ultimately lead Latin America's largest economy is unknown, as during the campaign he reversed course from previous statist stances with pledges to lead market-friendly reforms. He also promised to overhaul Brazil's pension system and privatize several state-owned companies, which gave him wide support among financial players. On Tuesday, Bolsonaro reiterated his commitment to fighting crime in a nation that has long led the world in annual homicides. More than 63,000 people were killed last year. He wants to tackle the problems in part by shielding police who kill during an operation from criminal prosecution. "We are counting on Congress to provide the judicial support so police can do their jobs," Bolsonaro said, signaling that he may soon submit legislation that would allow police to be tried outside the criminal system. Human rights groups fear that defence of police violence could shield officers from investigations of misconduct and lead to more extrajudicial killings. 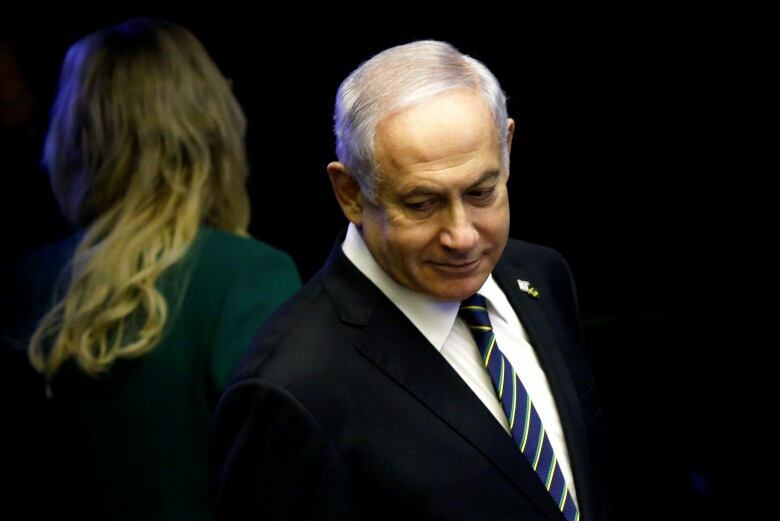 The most notable foreign leaders who attended were associated with far-right movements: Israeli Prime Minister Benjamin Netanyahu and Hungarian Prime Minister Viktor Orban. Leftist Presidents Nicolas Maduro of Venezuela, Daniel Ortega of Nicaragua and Miguel Diaz-Canel of Cuba, deemed dictators by Bolsonaro, were uninvited by Bolsonaro's team after the foreign ministry sent them invitations. Leftist President Evo Morales of Bolivia, however, was invited and warmly embraced Bolsonaro after the ceremony. The United States was represented by Secretary of State Mike Pompeo. Seven of Bolsonaro's 22 Cabinet ministers are former military personnel, more than in any administration during Brazil's 1964-1985 dictatorship. 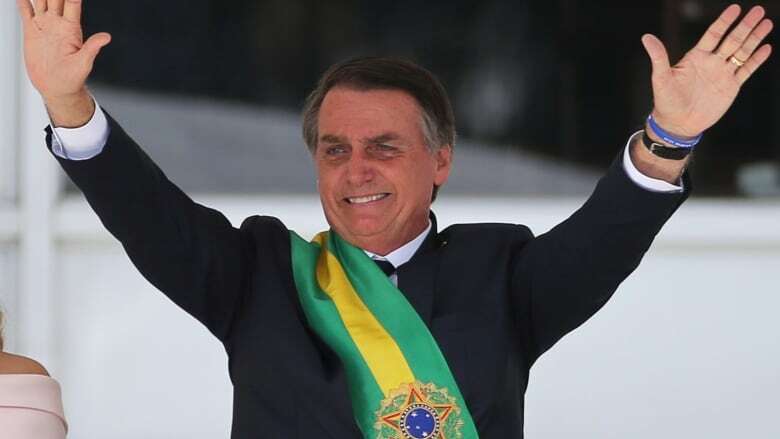 That has sparked fears among his adversaries of a return to autocratic rule, but Bolsonaro insists he will respect the country's constitution. Riordan Roett, a professor and director emeritus of Latin American Studies at Johns Hopkins University, noted that generals have administration skills that can be useful in government. "The danger is that as a former low-ranking military officer, (Bolsonaro) will be swayed by some of the generals to come down hard on criminality, drug dealers, etc., and that may cause a backlash and many innocent people could be caught in the crossfire," Roett said. Bolsonaro's Liberal and Social Party will have 52 seats in Brazil's 513-member lower house, the second largest bloc behind the Workers' Party. Gary Hufbauer of the Peterson Institute for International Economics, a Washington-based think tank, said a central challenge for Bolsonaro will be curbing spending and entitlements, no easy task given the makeup of Congress and entrenched interests. "Bolsonaro needs some quick successes to get off on the right foot with the public and the political elites," said Hufbauer, adding that a failure to do that would likely reduce Bolsonaro's honeymoon period to six months.